Newcastle vs Swansea | NUFC Blog. Archive for tag: Newcastle vs Swansea. Date: Saturday 19 April 2014. 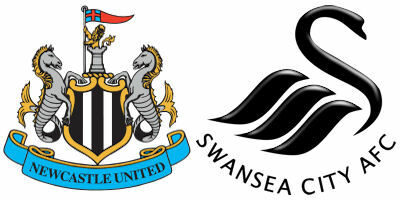 Newcastle host Swansea at St James’ Park this weekend as both teams seek to improve on a bad run of form. Newcastle have looked like a team already on their holidays lately. The rubber alligator is on the roof rack of their Bentley Continentals, the caravan is hitched to the tow-bar and they’re halfway down the M5 on the way to Cornwall. Or at least that’s the way it seems if recent performances are anything to go by. But the combination of a home fixture against a team also amidst a poor run of form and the return of some key players from injury might give us half a chance of some points this weekend. Allegedly, the target Mike Ashley set for Alan Pardew this season was a top ten finish. We’re currently in ninth place, three points ahead of Stoke and even if they overtake us we’ll finish tenth and achieve Ashley’s target. However, thanks to a victory against Everton at Goodison Park this week, Crystal Palace are only six points behind us in 11th place and in fine form having won their last four games on the trot, including a creditable win against Chelsea. So a top ten finish is by no means guaranteed yet.